What to write after not writing here for quite a while? Apologies? No, I hate it when blog writers apologize for not writing. Who wants to read that? A long story about what you’ve been doing since the last blog post? No, too long and often boring. Blogs are immediate and focused on what’s happening NOW in the writer’s life. I won’t bore you with a long story. How about some photos? Everyone likes photos and you know what they say about pictures and words….. In early June we went to Spain for two weeks. During that time was KIP day (world wide Knit In Public day) so that’s what I did. I put 188 photos from the trip up on flickr. You can see the set here. No, I haven’t labeled them all. Sheesh. No time. Have fun figuring out where we were! I’ve been running of course. 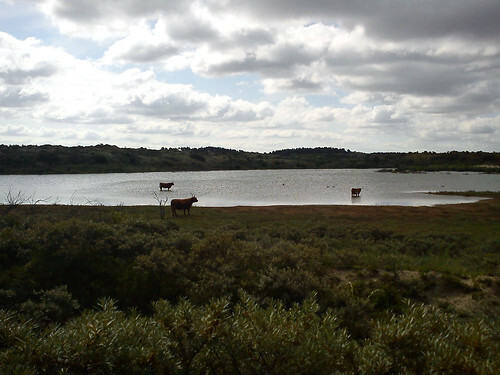 The last 2 times I’ve run in the dunes, the long horned shaggy cows have been hanging around the small lake on my route. Here’s a nice photo of the small lake. I’m still on schedule with training for the Dam to Dam in September. Cross fingers! 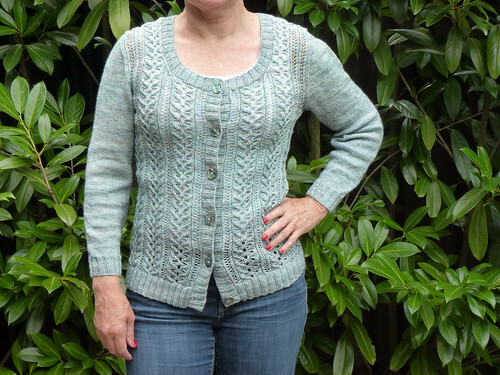 In mid-July I finished knitting my Honey Bee Cardigan, just in time for Knit Nation! I worked like a fiend on this sweater to get it finished and blocked and dry just minutes before it had to go into the suitcase. It fits really perfectly and I’m very happy with it. 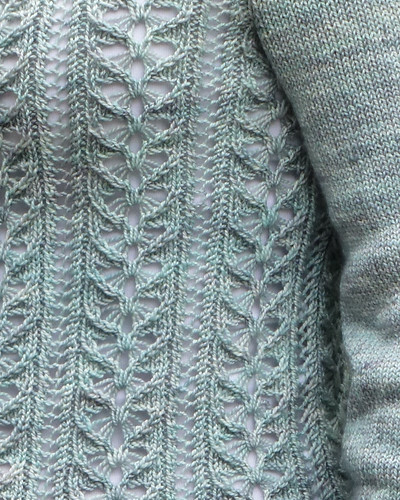 It’s made with Madelinetosh Tosh Sock, in color Celadon, 3 skeins, 3.25mm needles. It’s knit from the bottom up, joining the sleeves to the body and knitting them in so there’s absolutely no sewing at all. Lovely. Then there was Knit Nation! London, 3 days, at Imperial College. I took a class from Cookie A. and from Merike Saarniit. I went to the market place and only bought Wolmeise yarn (and only 7 skeins) and 1 book of lace patterns. I have a house full of yarn so only bought what I really really wanted and couldn’t live without. It’s was a great 3 days hanging out with knitters and the weekend was especially nice because of all the time spent with M. We rented bikes, went for a run in Hyde park, and had dinners together. 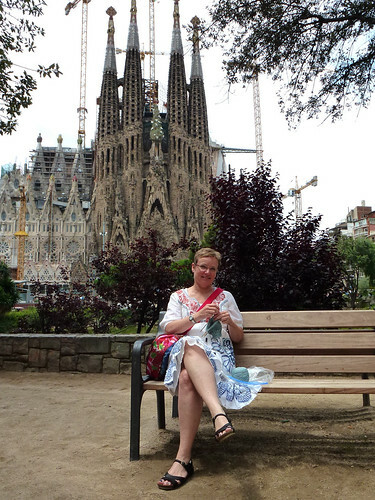 What a lovely person (and you know who you are) and I’ll be your travel partner any time. Here’s a photo of Cookie A. teaching our class. Since I had so much knitting time (I took the train to and from London), I finished my June SKA socks in time! Yea! I had until the end of July and just finished them this morning. These are GUSH socks from Yarnissima. 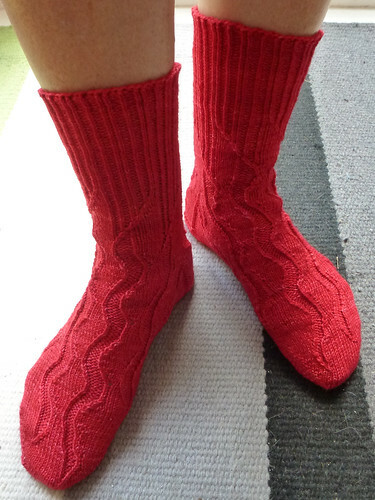 They are made with Madelinetosh Tosh Sock in color Scarlet. They fit perfectly, just like all Yarnissima patterns. What am I working on NOW? The second Seasonal Sock – Fall, the brown knee sock. I still have the second sock to finish! And there we are, all caught up. Sounds like you have been having a most wonderful time, especially Knit Nation- much more cruisey than Stirling! Your Honeybee is lovely… and am wondering what the exciting news is!! You’ve made me VERY curious!! What a beautiful cardigan! 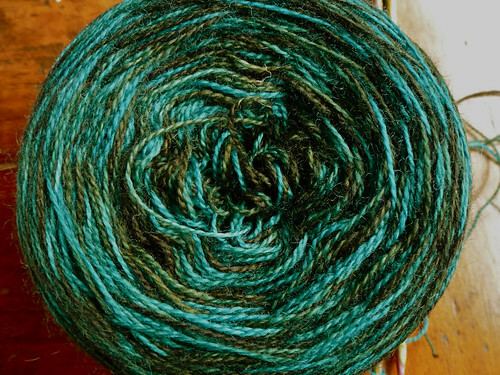 I love reading about Knit Nation — sounds like you had a wonderful time there. You’re so bad!! Four days? It’s been more than four days. By the way, I love that little Honey Bee cardigan on you.